KTimeHR’s HRIS has achieved the American Institute of Certified Public Accountants (AICPA) SSAE 16 SOC 1 Type II and AT101 SOC 2 Type II criteria for security, availability, and confidentiality. Additionally, the EU/US Privacy Shield Framework has certified its compliance. 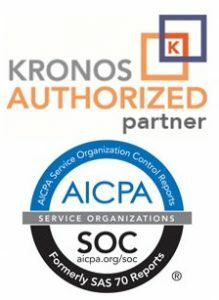 For additional information regarding the enhanced security of our Kronos product, Workforce Ready Suite, please click here.